STFU court-order passed quietly on Wednesday. local political official--and, of course, his children. assured, it's in her best interest to stay STFU." 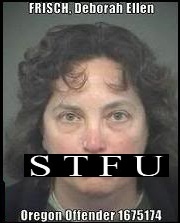 ways to go: The court's STFU probation order does not expire until March 2014.